OVERVIEW: The journey for survival begins on May 25th when The Road arrives on Blu-ray and DVD from Sony Pictures Home Entertainment. 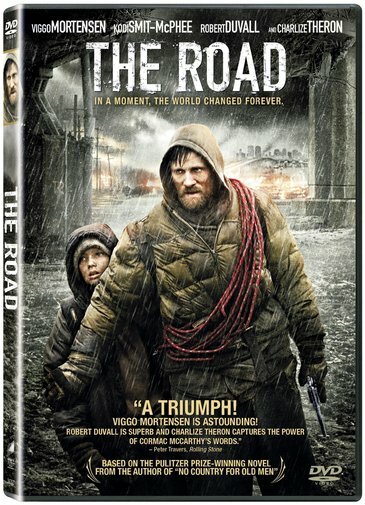 Based on the 2007 Pulitzer Prize-winning novel by Cormac McCarthy ( “No Country for Old Men”), the film features an all-star cast led by Academy Award® nominee Viggo Mortensen (Eastern Promises, A History of Violence), along with Academy Award®-winner Charlize Theron1 (Monster, Hancock), Academy Award® winner Robert Duvall2 (Crazy Heart, Four Christmases) Guy Pearce (Memento, The Hurt Locker) and Critic’s Choice Award Nominee for Best Young Actor, Kodi Smit-McPhee (Romulus, My Father). Directed by John Hillcoat (The Proposition), the powerful film takes place in a ravished post-apocalyptic America as a father and his son struggle to stay alive on the journey of their lives. SYNOPSIS: A father (Mortensen) and his young son (Smit-McPhee) fight to survive after an unspecified apocalyptic event, traveling toward the warmer coast with the hope of possible food, safety, and the company of fellow survivors. Along their journey, with scarce shelter and resources available, they encounter many horrors and hardships, and must endure the constant fear of roaming cannibals and other desperate gangs. Despite having next to nothing but each other, and with little more than the clothes on their back, a rusty shopping cart and a pistol for defense, they manage to maintain their humanity, decency and a human connection. DVD: The film is presented in widescreen with a 2.35:1 aspect ration preserving its theatrical format. Looks clean, images without any types of color saturation. Sony Pictures Home Entertainment has done pretty good job with this transfer. Not only the picture looks good in this version of the film, also the sound it is good. A Dolby Digital English providing a nice complement to the picture. It also includes English subtitles. Unfortunately the DVD doesn't include French and Spanish subtitles, which I found to be considering the big Hispanic population in the USA. In terms of special features the DVD includes deleted and extended scenes, A Directors commentary and "The Making of The Road" featurette, which is behind the scenes of the film with commentaries from the filmmakers and the cast.